While it is easy to see our state's natural beauty, it isn't as simple a task to present it in an exciting, clear and scientific way for students, adults and others to learn from and enjoy. The museum's curators, educators, scientists and other staff work nonstop to provide our citizens with a one-of-a-kind experience that's as exciting as it is educational, and I'm proud of their continued dedication to public service. The NC Museum of Natural Sciences with its Research Lab and adjacent Prairie Ridge Ecostation and also its branch in Whiteville, Columbus County is a division of the NC Department of Natural and Cultural Resources ( http://www.ncdcr.gov) alongside 27 historic sites, seven history museums, two art museums, three aquariums and Jennette’s Pier, 39 state parks and recreation areas, the N.C. 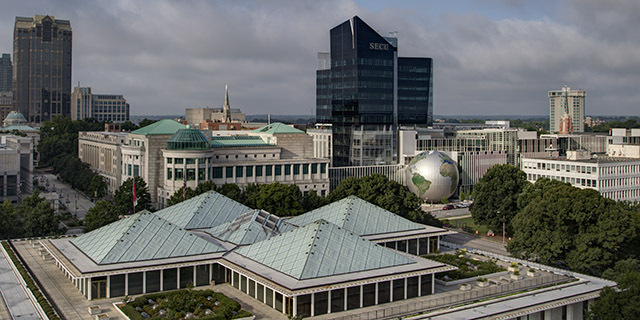 Zoo, the nation's first state-supported Symphony Orchestra, the State Library, the State Archives, the N.C. Arts Council, State Preservation Office and the Office of State Archaeology, along with the Clean Water Management Trust Fund and the Natural Heritage Program. Museum staff are therefore public servants, however the Museum is an unusual part of the Public Service. Why? Reasons include the facts that the Museum works seamlessly with nonprofits throughout North Carolina; the Museum’s approximately 150 full-time public servant positions work side-by-side with almost 70,000 hours of volunteerism annually; the Museum’s mission depends on a myriad of national and international connections as well as an extensive suite of collaborations across the corporate and nonprofit sectors; the Museum attracts project grants from national agencies, such as the National Science Foundation, and private foundations; the Museum’s total operation depends on facility-focused resources from the Department of Administration in addition to the core appropriation from the Department of Natural and Cultural Resources; and many of our research positions are joint appointments with the University of North Carolina System. Overall, in the total of this Museum’s annual funding level, approximately 30% is from non-State sources. In a museum field context, the NC Museum of Natural Sciences is a unique hybrid type of institution. When compared with both larger and smaller US museums of natural history and natural sciences, this Museum has among the very highest productivity/cost ratios.